This is my family’s “go to” beach vacation. Kiawah Island is a gated resort community located about 45 minutes south of Charleston, SC. It is a developed island but has so much natural beauty and wildlife. No high rises or amusement parks here. 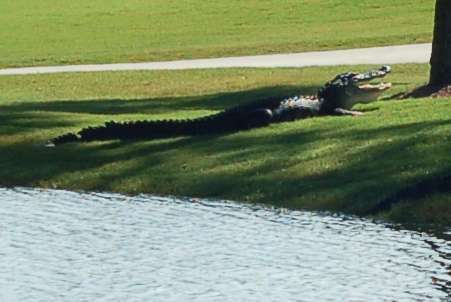 We always see alligators and have even seen a bobcat on the dunes! It has a wide 10-mile long beach and 30 miles of paved bike trails. It also has a pool, playground, disc golf, and a nature center that offers many programs. You can be as lazy as you’d like or as active. We always park the car for the week and rent bikes to ride to all the activities. 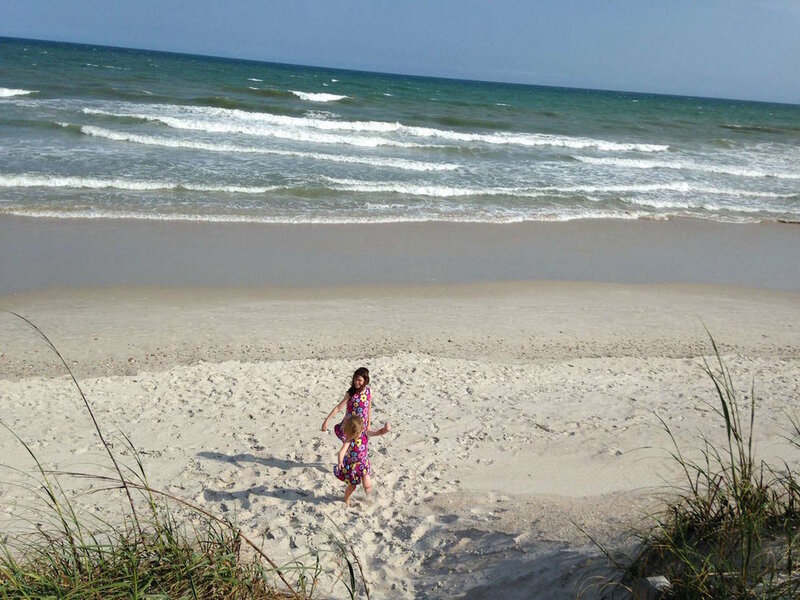 Also, see our blog post "Kiawah Island-My Family's Favorite Beach Vacation." Kiawah offers villas, houses, or hotel rooms in the lush Sanctuary Hotel. Because of beach conservation, most homes are located off beach. We have always found it to be much less expensive by renting a villa through VRBO or Homeaway. Kiawah separates itself into 3 areas: East Beach, West Beach, and Vanderhorst Plantation. We like the East Beach location because of its proximity to the Nature Center and Night Heron Park. If you want to play in the Night Heron Park swimming pool which offers a super water slide and other water features, you will need to look for vrbo listings that come with “Resort Privileges.” There are many villas to choose from, but we generally choose from Parkside Villas, Mariner’s Watch, Night Heron Cottages, Tennis Club Villas, or Inlet Cove Cottages. We always look for clean, nicely decorated, recently remodeled villas with a screened porch which is a must for us. Remember: If renting through VRBO.com, remember to look for listings with "Resort Privileges" for pool access. Parkside Villas are usually my first choice for location. These 2 and 3 bedroom villas are a short bike ride to the pool and Nature Center and are about a 10 minute walk to the beach. They have screened porches where we love to eat, read, and play games. If renting a 2 bedroom, look for 2nd floor options to avoid the sound of footsteps above you. The 3-bedroom option on the lagoon has a nice deck in addition to the screened porch. All of the listings below come with resort privileges. 3 BR Premier Parkside Villa on Lagoon with Dock and Resort Privileges VRBO 52621. 3 bedroom, on lagoon, with dock. 3 BR/3 bath Premier Parkside villa, Dock on Lagoon, Full Resort Privileges. VRBO 606986. 3 bedroom, on lagoon, with dock. These villas are closest to the beach (3 minute walk) and come in 1 and 3 bedroom options. The three bedroom option is expensive if it has ocean views. The 1 bedroom works well with young children sleeping on the pullout sofa bed. 2nd floor preferred. Beautifully Updated - 200 Steps to the Beach! Night Heron Pool! Resort Privilege. VRBO 408925. 2nd floor, 1 bedroom with sleeper sofa, nicely decorated with resort privileges. The Tennis Club Villas are further away from Night Heron Park, but you can easily bike to it. Beach access is close by. You can usually find a nicely decorated, less expensive option here. Mid-Week Discounts & Resort Amenities. Nicely renovated 1 bedroom villa. VRBO 744595. 1 bedroom with sleeper sofa and resort privileges. Complete renovation happening this winter!Book your 2018 stay!Resort privileges! VRBO 570358. 1 bedroom with sleeper sofa and resort privileges. We stayed here once and really enjoyed it. These stand-alone 3 bedroom cottages are located across from Night Heron Park. The location is very good, and it’s nice not to share a wall with your neighbors. The listings here have resort privileges. Renovated Night Heron Cottage, Full Resort Privileges. VRBO 337291. Sleeps 8. Double bunks in third bedroom. 3 BR/2 BA New Renovation. Near Ocean-Pool - Resort Privileges. VRBO 274864. 1 King, 4 twins. Pets allowed except during summer season. These stand-alone 3 bedroom cottages are located in West Beach. If you stay here, you’ll be a long way from Night Heron but you can use the community pool. If you enjoy sunsets over the marsh and river, you should check out the riverfront cottages with a view. You have access to their small community pool but most of these do not provide access to the water park at Night Heron. Also keep in mind that your closest beach access will at the public beach. Great River Views, Renovated, Close to Beach, Heated Pool, Water Parks & More. VRBO 172334. Has access to water parks. When you check-in, you will be provided with a Kiawah Recreation Guide listing restaurants and activities by day. Kiawah Resort provides many classes, programs, and activities for all ages such as kayak tours, a junior naturalist program, alligator walking tours, night time beach walks, and more. 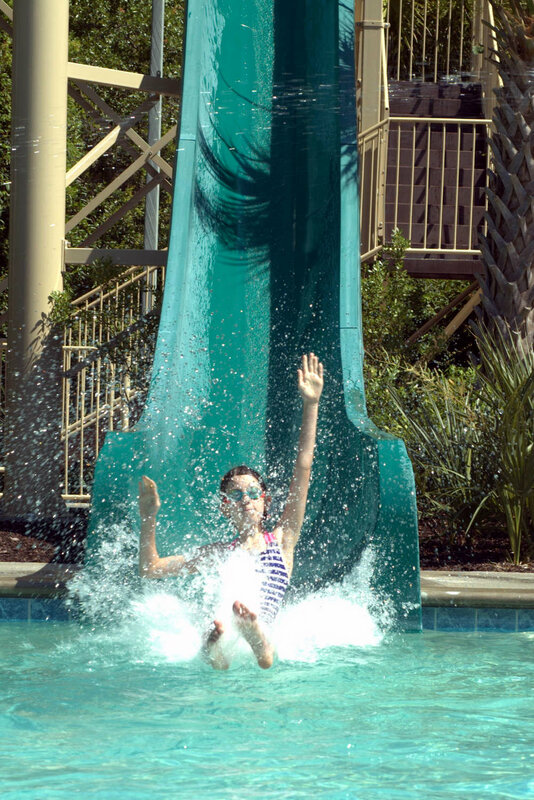 They also provide “Camp Kiawah” for the kids if that appeals to your family. Although I dislike scheduling anything on vacation, some of these offerings are very unique. My girls like attending the afternoon craft of the day at Night Heron Park. We have brought home many keepsakes from these: shell necklaces, tie-dyed t’s, stepping stones, etc. We’ve also taken a kayak tour which was fantastic but a bit pricey. Ride Bikes: You can bike on the beach or on 30 miles of paved bike trails. We bike everywhere--to the beach, the pool, the river. Bring your Kiawah map along (provided at check-in) and explore the entire island. You can bike to watch towers, lagoons, lakes, and ice cream stores. I like to bike past Bass Pond to Rhett’s Bluff to view the southern architecture of the homes and see the river. There’s a sandy path from the road that goes right along the river or you can bike through the parking lot to the water. We also like to bike to the West Beach Village for an ice cream cone. It is less expensive to rent bikes from outside the resort. We usually choose Seaside Cycles. You can book online at https://seasidecycles.com. Swim at the Pool: Night Heron Park Family Pool features two open flume slides, a splash zone, interactive spray features, dumping buckets, etc. Note: Children must be at least 44” tall to go on the slides, but it has a shallow beach-entry area for the little ones. And yes, adults can go down the slides too. A regular Olympic size pool is next door if you want to swim laps, shoot basketball, or float around. Go To The Beach: 10 miles of beach to explore! Say no more. Bring the beach chairs, a shade umbrella, boogie boards, and a bucket and shovel and have fun in the sun. You can also rent chairs and an umbrella from the resort. We usually bike to the beach and park the bikes in the racks provided at the board walk. The Night Heron Park Nature Center: You can easily visit here multiple times during your stay. The Nature Center is located in Night Heron Park next to the pool. It is a fun stop to learn about the island’s wildlife and get information on recreation activities and recent nature sightings. Kids can report times and locations of animals they see during the day. They have live turtles and baby alligators as well as other wildlife on display. Dolphins: Bike all the way south on the beach to Captain Sam’s Inlet at low tide to see dolphins “strand feeding.” This is the most remarkable sight where a group of dolphins herd a school of fish onto the beach of the Kiawah River. The dolphins then beach themselves onto the shore to feed. Your best chance to witness this event is at low tide. Check the tide charts in Kiawah’s Recreation Guide. This is a long bike ride from East Beach. Depending on wind direction, it’s often easier to bike on the bike path rather than on the beach. You can also drive or take the Kiawah Shuttle to Beachwalker Park and walk the mile to get to Captain Sam’s Inlet. Disc Golf: If you like to play disc golf or have never tried, Kiawah has a nice course in Night Heron Park. Bring some cold drinks to enjoy and bring your own discs or rent from the Nature Center. Playground: Night Heron Park also boasts basketball courts and a playground for the young ones. This is a good biking destination too. Angel Oak Tree: When you drive to Kiawah Island from the main land, you will drive right past The Angel Oak Tree. This magnificent, old tree is thought to be 400-500 years old and measures 66.5 feet high and 28 feet in circumference. I’m a sucker for an old tree and it’s free to visit this one. A good idea for a rainy day or make sure to go on the way to Kiawah or upon your return. It’s only a few hundred feet off of Maybank Highway (the main road leading to Kiawah and Seabrook Islands).If driving from Kiawah, it’s about a 25 minute drive. Remember to bring your camera! Day Trip to Charleston: Kiawah is a 50-60 minute drive from Charleston, depending on traffic. Take a horse drawn carriage ride, visit the Historic City Market, go to the Aquarium, tour Civil War sites such as Fort Sumter, or eat at wonderful restaurants. Charleston has it all. For more information on Kiawah Island Resort, visit their website for up to date activities and events including golf and tennis info. Kiawah Island offers many restaurants, and the shuttle will take you to any of them. Our family likes to cook simple meals in the villa or get takeout from The Market at Kiawah Town Center. They have terrific she-crab soup, pizzas, sandwiches including a yummy crab cake sandwich, and select entrees. All are reasonably priced for not getting back in your car and not cooking while on vacation. They also have a children’s menu. We usually call ahead and then bike over to pick it up. We love dining on the screened porch and find it much more relaxing than dragging the kiddos to a restaurant. If you like to dine out, I would suggest Jasmine Porch in the Sanctuary Hotel (walking distance from East Beach lodging) featuring low country cuisine. Another choice is the Ryder Cup Bar at the Ocean Club. It’s located on the Island but you will need to drive or shuttle there. It offers an amazing view of the 18th hole and the Atlantic. We saw an amazing sunset here. Harris Teeter Grocery is located in Freshfields Village off the roundabout at the entrance to Kiawah. Freshfields Village consists of several shops, restaurants and the Harris Teeter Grocery Store. It is super convenient and about a 10 minute drive from East Beach. It is a large grocery store and will have everything you need. They have a super deli with all kinds of hot and cold takeout including take and bake pizzas. The store also sells local shrimp, beach toys, and a good selection of craft beers and wine. Tip: You can order online and pick up. P.S. Freshfields Village also has a good bookstore, Indigo Books, if you need a good read at the beach. Great recommendations from their staff. You might also be interested in these destinations. If you have an awesome photo and send it to us #simplyawesometrips, we will post it to our Instagram page. We love seeing your vacation photos. Honestly.